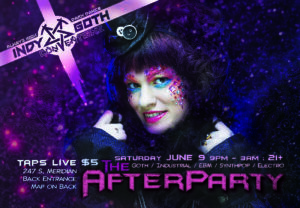 IndyGoth Conventions presents another round of *The Afterparty* on the Saturday June 9th, all night long! 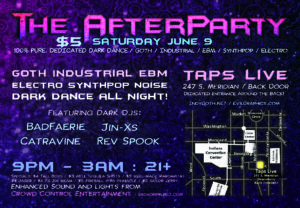 Low-cover, 100% Dark Dance (No mainstream BS) mayhem! A couple of blocks from the Indiana Convention Center 247 S. Meridian; around to the back entrance! DJ super-team running all night: Hometown Heroes Jin-XS, Badfaerie, Catravine and Rev Spook! HEAD TO THE BACK ENTRANCE OF THE BUILDING to avoid lines for the other clubs in the building. To let your freak flag fly, Taps Live is the only place you want to be! No badges necessary, open to the public! Costumes are welcomed and encouraged!